Yep, we’ve all been there…the Pinterest fail. How many times have you scrolled through Pinterest, saw something beautiful, and said, Hey, I can do that! Next thing you know, the project ingredients or supplies are sitting in a corner in the garage (maybe with the OTHER Pinterest fail supplies…), OR, maybe you actually tried it, and, well, it didn’t quite turn out like the picture. And then, after a LOT of trial and error, you get it JUST right. Bath bombs were MY Pinterest fail, at first. 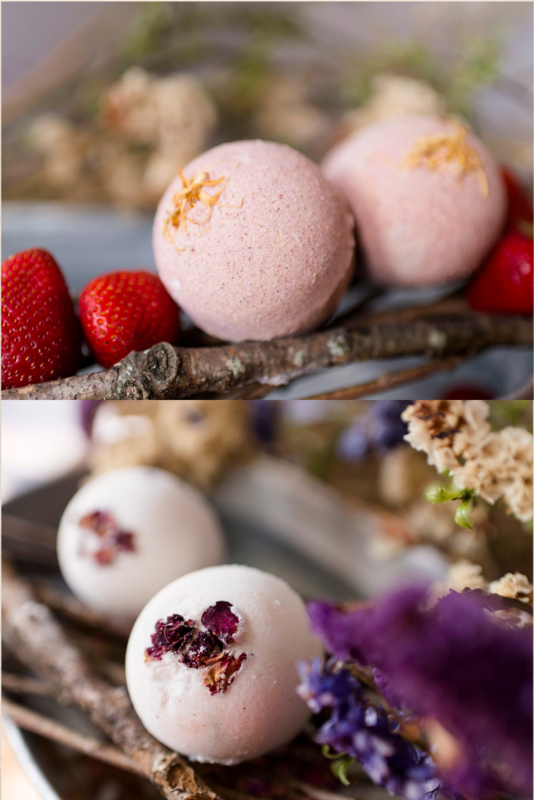 But after a few months and a LOT of work, I can proudly say that not only do I make TERRIFIC, nourishing bath bombs, I can honestly say that I really love making them! And I’ve learned a few tricks along the way that may help you in your bath bomb journey! Most bath bomb makers will tell you that it just doesn’t work to make bath bombs on a super-humid day. I’ve had everything from warts (bath bomb bumps popping out all over the bomb) to crazy-sticking in the mold. At one point during the heat of our Virginia summer, I just said No More! and took my bath bombs off my listings until the weather settled down. But as a military family, we’ve lived in a lot of different regions of the country, and you would be amazed at the variances in temperature, weather and humidity. If you live in a warm, humid area, you may have to wait til you have a really dry day to try your hand at bath bombs. The good news? Once you’ve made them and dried them, you can shrink wrap, and that will keep out any moisture for several months. Keeping them in a glass apothecary jar allows a little air in, which is good, and also makes a beautiful bathroom display. This is especially important if you do live in a higher humidity area. Your mixture should be like “just” damp sand, and for me, it was a drier mixture than what I thought at first. Your oils, fragrance and/or essential oils, and your binding agent all add to the moisture content, so add more of those with caution and only a little at a time. This one has been really important for me. At first, I was really packing the mixture into the mold, and then there was no room for the mixture to adhere to the other side of the mold. Use a lighter touch, and then really pack the two sides of the mold together once you’re joining the molds, so that the two sides adhere to each other. This was a bit of a hurdle for me, as I wanted to create a truly natural product. However, I found that adding a little bit of SLSa to my bombs really brought out the fizz and longevity of the product. What is SLSa? SLSa is Sodium Lauryl Sulfoacetate, and those words may leave you wanting to run for the hills, but don’t worry! This is not the same compound as SLS, or Sodium Lauryl Sulfate ( a harsher chemical compound), but rather one that is naturally derived from coconut and palm oils. SLSa is a natural, non-GMO product, and in truth, it really helps by adding more bubbles and fizz, and also helps your bath bomb experience to last longer. A little goes a long way with this product, and it truly does bring out the best in my bath bombs. CLICK HERE to see my selection of natural bath bombs! Give those bombs a cushy resting place! 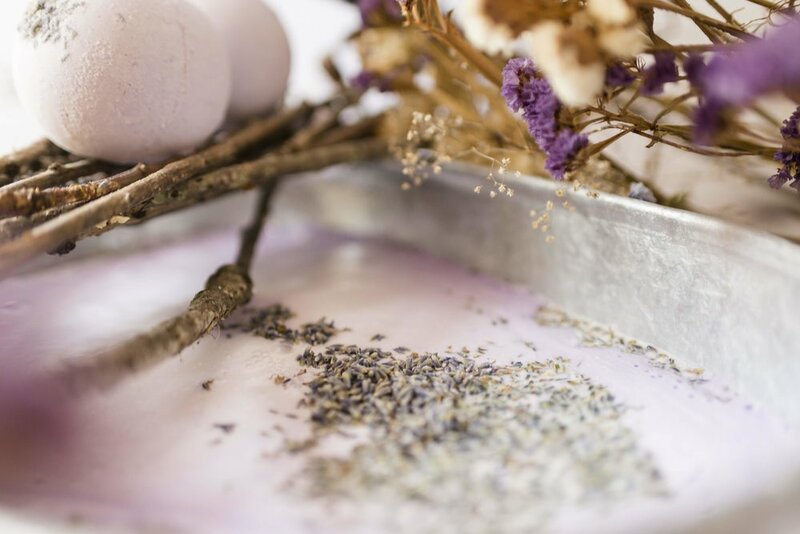 Once those bath bombs are done and looking great, let them dry for 1-3 days on a cookie sheet or other flat surface lined with a clean towel, some bubble wrap, or other cushioning material, so they don’t go flat on one side. It won’t hurt for a bath bomb to have a “dent”, but hey, it’s all in the presentation, right? Oh, and do make sure those bombs are COMPLETELY dry all the way through before packaging, or they WILL get soft once they’re inside your shrink wrap. Ask me how I know. You can check them by breaking one open and making sure it’s dry all the way to the middle of the bomb. My bombs are an extra large size and sometimes take longer, if they’re smaller they will dry through more quickly. WANT TO RELAX IN A SPA BATH RATHER THAN MAKE BATH BOMBS? WE GET IT!! That’s why we sell a great selection of nourishing bath bombs in our shop. We even have a bath bomb gift set you can give to someone you love…or just keep for yourself, we won’t tell! Pair them with one of our amazing soy candles for the ultimate spa experience!